Looking back at STAR TREK II: THE WRATH OF KHAN | Warped Factor - Words in the Key of Geek. In this week's Star Trek column Tom Pheby looks back at the second Star Trek movie, 1982s The Wrath of Khan. 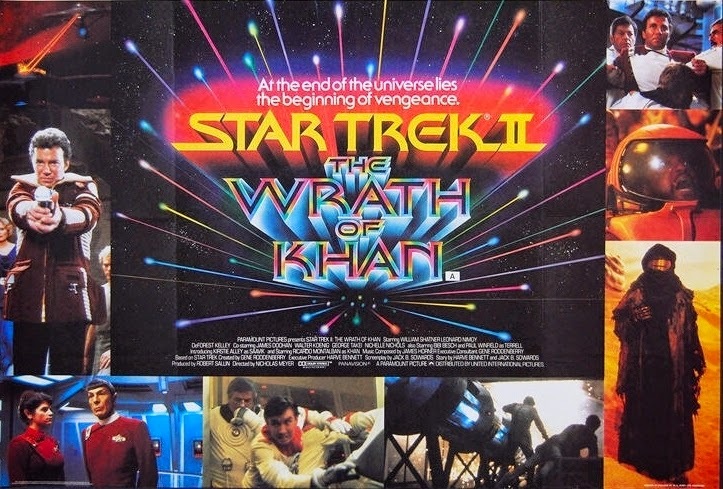 Star Trek II: The Wrath of Khan is without question my favourite film of the older big screen outings. After the lukewarm reception given to Star Trek: The Motion Picture, a number of major changes in personnel were required. This meant that Gene Roddenberry was jettisoned from this particular installment along with director Robert Wise and writers Alan Dean Foster and Harold Livingston. In came Nicholas Meyer, who at the time was better known as a writer rather than a director - bit of a gamble. After receiving the script, Meyer worked feverishly on a revised final draft, completing it in just 12 days (but incidentally remained uncredited when the movie was released). We discover that Kirk is now guiding recruits and nurturing potential Starship Captains, Spock is the one in the Enterprise Chair and Chekov is serving with Captain Terrell on-board the USS Reliant. Their mission is to survey near by lifeless planets for an experiment called the Genesis Project. Put simply, it's a device that can turn barren and lifeless planets in to a paradise to support life forms. Chekov and his Captain believe they have located such a place, but on their arrival find they have entered a trap set by the vindictive and vengeful Khan (Ricardo Montalban). Khan has spent 15 years marooned on the wastelands of Ceti Alpha 5, courtesy of James T Kirk, and he's certainly not in a forgiving mood. He learns of the Genesis Project, commandeers the Reliant and heads off to steal it. The pioneers behind the Genesis Project happen to be Kirk's old flame and his son (physical proof that perms are alive and well in the future). Both are duped by a subservient Chekov who has a bug in his head that makes him capitulate to naughty Khan's will. Chekov claims that the device is to be seized on Kirk's instructions, but when the Admiral is contacted by his old squeeze, he denies all knowledge and hot foots it to protect all concerned. The undoubted highlight of this outing is the almost nautical encounter between the two ships playing cat and mouse in space and trying to destroy each other. It's all very Das Boot, absolutely brilliant and a genuinely tense section of the movie. Of course Kirk wins eventually, but he pays a heavy price by doing so, this adds an emotional and personal dimension that was alien to Trek prior to The Wrath of Khan, making it all the more intriguing. The Wrath of Khan provides us with an opportunity to be entertained by Ricardo Montalban. He sneers and snarls his way through the adventure, and it's his vitality and energy that is a key element to the films success. But Shatner also provides his most compelling performance as the outwitted and vulnerable Kirk. In terms of Khan you could almost be forgiven for thinking that the costume designer was heavily influenced by the Wild West when it came to his garb. Part Cherokee Indian or Indian Chief (I'm not entirely sure which), draped in beads and symbols and wrapped in buck skin. The look was completed with a moist and hairless chest. I almost expected him to be on a saddle, rounding up stray cattle! Leonard Nimoy (who only agreed to appear if his character was to be killed off) provides the gravitas and awesome logic of Spock, and DeForest Kelly's McCoy is faultless as a constant reminder of the ravages of time and its subsequent limitations. How we all love and hate a friend that tells the truth as often as Bones does, it just irks that he is constantly right and knows more than we do. McCoy is the antidote to all the other stuff going on, he speaks loud and clear as an impartial observer amid all the madness and is not phased by rank or reputation. It was said that Roddenberry had a storyline which involved JFK which would have been quite predictable and probably ploddy. As it turned out without his input it all came together nicely, and was perfectly engineered to give us a platform for more adventures. 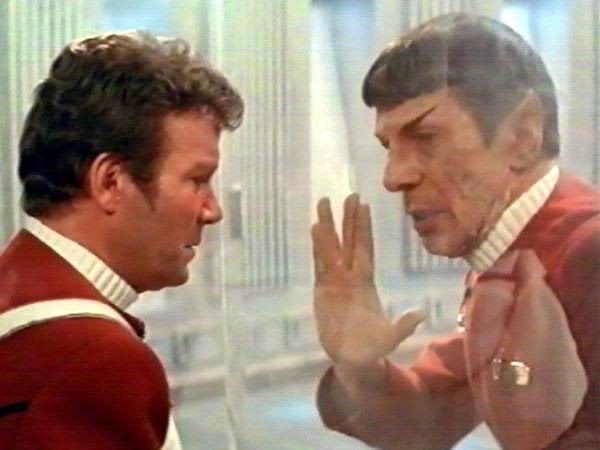 In short, The Wrath of Khan saved the franchise, gave it new depth, direction and purpose.